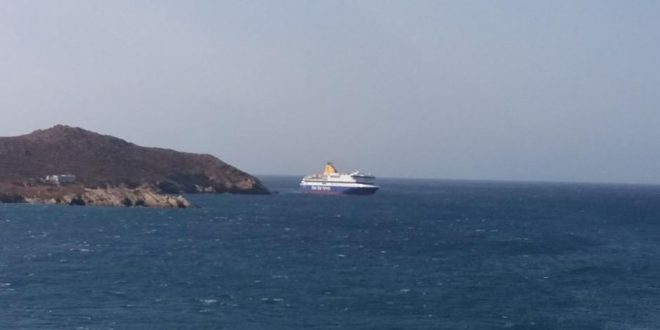 Ferry BLUE STAR PATMOS remain aground off the island of Ios on Thursday morning and inspection is expected to continue during the day. On board is half of the 87-member crew, while the other half and the 205 passengers were evacuated short after the accident occurred in the early morning hours of Wednesday. 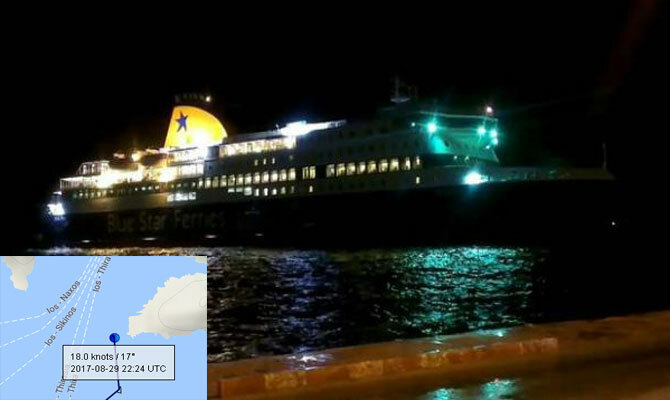 Blue Star Patmos ran aground at 01:45 local time August 30th 2017 while entering the harbor gulf of Ios island in the Aegean Sea, with 205 passengers and 87 crew members on board. “The vessel suffered hull breach with ensuing water ingress, which said to be small and under control,” initial reports said. Passengers were transferred to Ios by shuttle vessels, all reported safe. Tug boats are stand by to pull the ferry free. For the second day today, divers from the port authorities and ship inspection officers from the classification society to which the ferry was registered with will attempt to assess the full extent of the damage caused. Port Authorities also investigate. As the ferry remain aground and underwater survey is being conducted, questions arise as to what to the accident and how a tragedy could be averted. 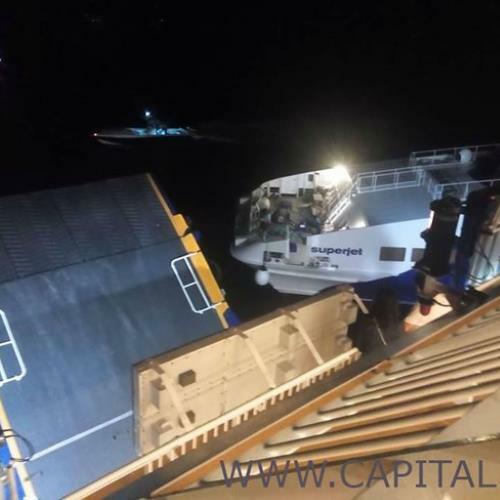 The ship remains grounded at the entrance of the harbor, while the passengers and 44 crew members have been transported to safety on Ios in the high-speed catamaran “SuperJet” and the tourist boat “Vassilios”. 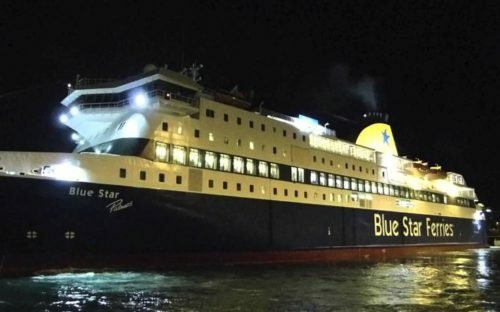 The “Blue Star Patmos” started taking on water on the starboard side after the impact but this has now stopped, the ferry company reported. Three tug boats were sent on Wed to help pull the ship free, after divers and technical engineers complete inspection. 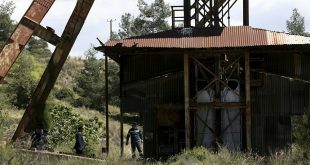 Although it is not officially confirmed neither by the shipping company nor the Port Authorities, “the breach is up to 80 meters,” capital.gr writes citing sources. 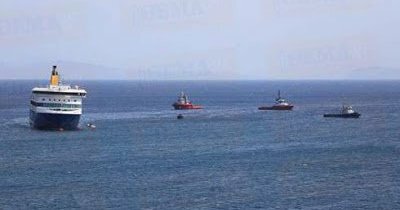 “All sailors are aware of the big reef in the area,” captain’s colleagues told HuffingtonPostGreece. They speculate either ‘dysfunction of the ferry’ or a ‘wrong estimation’. “The ferry position was more in the East than it should,” experienced sailors say. The Voice Data Recorder (VDR), the ‘black box’ of the ferry add to clarification of the causes of the accident. The ferry was on a route from Piraeus to the islands of Syros, Paros, Naxos, Ios, Thira and Anafi. In addition to the passengers, there were – and still are- 21 cars and 12 trucks on board. None of the passengers were injured during the impact and no marine pollution has been detected. 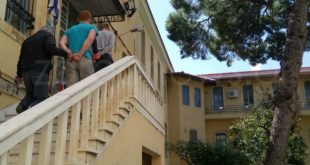 The ferry company will make arrangements to get passengers to their respective destinations, athensnewsagency reported. The evacuation took place about two hours later. An American tourist on board of the ferry described the moments of the crash. These words belong to US citizen Angela Tucciarone, who, along with her husband, was on board of the Blue Star Patmos. 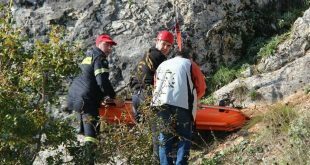 Tucciarone said that initially the evacuation was to take place on small fishermen boats that had rushed to the ferry. But this was difficult to impossible due to the rough sea and that many older people could manage to get on the small boats. Even the evacuation to the two vessels was difficult, however, they were all disembarked in safety on Ios. “We all some two hundred people slept on the chairs of the closed cafeterias at the port, until we got on board of another ship at 7 in the morning,” she said. “Tho their credit, the owners opened the cafeterias at 4 in the morning and we could eat and drink something,” she said. According to Cyclades24.gr, the mayor of Ios praised the immediate and effective response of the local community. In a statement he said that accommodation was offered to all passengers of the ferry within a couple of hours. A praise also for the BSP crew that managed the safe and prompt evacuation of the passengers. 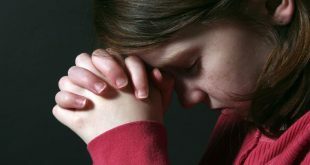 Greek media reported that the ferry could not be pulled free until the breach is closed. According to latest information, the ferry has suffered several breaches that are not deep, though, the water has reached the safety tanks but has not affected the engines. It is estimated that the ferry could sail on its own to the shipyard after the breaches are closed. Passenger ro-ro ship BLUE STAR PATMOS, IMO 9565041, GT 18498, built 2012, flag Greece, operator BLUE STAR FERRIES SA. The ferry can carry 2,000 passengers. PS Local communities on the islands are especially sensitive when it comes to ship accidents and are the first to respond. In July, I met a old fisherman on the island of Antiparos. He was among those who had rushed to help when passenger ferry Express Samina with a total of 533 passengers and crew on board run aground on the reefs off Paros and sank. 17 years later the fisherman could remember every detail of the dramatic night where 82 people lost their lives.